Episode #47 Timecapsule: The large goblin statue at Janeiro’s Point island has been a fixture in the Booty Bay lagoon for years. 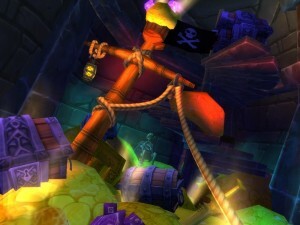 Created in his own likeness, Baron Revilgaz built the statue to enhance his place as ‘ruler’ over the pirate port city. The recent WoW Shattering of Azeroth has revealed an interesting surprise inside the Revilgaz statue – a hollow interior filled with treasure! Casual explorers who find Janeiro’s Point treasure may not realize that the key to earning this Shiny Reward is by completing the newest questline inside the Zul’Gurub instance. Completing the quest and looting the treasure inside the Janeiro’s Point statue will reward adventurers handsomely… including a unique Black Ice ring. This entry was posted	on Monday, May 9th, 2011 at 11:53 pm	and is filed under Podcast Episodes. You can follow any responses to this entry through the RSS 2.0 feed. You can skip to the end and leave a response. Pinging is currently not allowed. love your show keep up the good work =) and thank you for taking the time to do this. You are most welcome, Noxspecter. Very glad to have you as a listener. Thank you so much for doing this. I was an avid WoW explorer long ago, but I haven’t been able to play due to internet limits. If you want me to search something, I have plenty of time to search the internet to help. Great stuff! Always looking for long-time explorers. Long term, I’m wishing to put together a before/after retrospective of many of the ‘vanilla’ locations that are now vastly different. For example, pulling together original Mount Hyjal details/pics would be an interesting group. I’m glad you enjoy the broadcast & always feel free to add facts or personal exploration experiences to the show comments. Thanks! Didn’t realize you did the segments as a separate podcast. Great stuff, and I’ve enjoyed it since the begining. Thanks so much for all your work! Something interesting is that the dressing room wont show the ring on many models but it does show if you actually wear it. Interestingly enough, this statue in vanilla beta was a human. It was changed before release, perhaps because it was too simliar to Christ the Redeemer, or because it simply didn’t make sense that goblins would create a statue of a human. Or maybe they art department simply didn’t have the final art done. Anyway, I remember when it got changed, that change has always stuck with me. Wish I had taken a screenshot!